*These are basically sold out at this point. *** For the 2018 holidays, Marucci has released a special colorway on the CAT 8. It includes, among other things, a barrel with a money shaped theme. Up close on the barrel there are bills you can see. It also comes in a green and gold. The bat, which is a replica of the CAT 8 in BBCOR and USSSA, is a single piece aluminum with advanced knob and barrel tech. It prices out exa… Jump to the full review. We aren’t the only ones to have information about the CAT 8 OTM. Other places, in particular those who sell bats, usually have a boiler plate write up on the specs of a bat. Many of those we reference to make sure we are seeing what we should be. 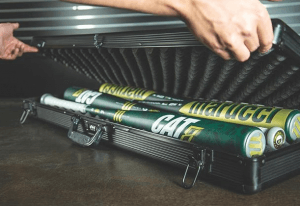 Here are some more references for the 2019 Marucci CAT 8 OTM review. It includes, among other things, a barrel with a money shaped theme. Up close on the barrel there are bills you can see. It also comes in a green and gold. The bat, which is a replica of the CAT 8 in BBCOR and USSSA, is a single piece aluminum with advanced knob and barrel tech. It prices out exactly like the CAT 8, which we think is fantastic. It easily makes our gift guide for ball players 2018. (See more images on Marucci’s IG account). The CAT 8 OTM stands for Cat 8 “On The Money”. On the whole, we are huge fans of the CAT 8. Those looking for a more traditional feeling single piece bat (not some two piece composite “magic”) will appreciate the honest feedback in a the CAT 8. The barrel size is remarkable considering the all aluminum design. The bat’s knob has a dampener (proprietary) that dampens sting considerably. The BBCOR CAT 8 is a big barreled single piece aluminum made for serious players. Our hitters love the sound and honest feedback. Exit speeds always look great. Swing weight put it right in the ‘average’ category. Not too light, not too heavy. We’ve yet to talk with a single player that didn’t like the CAT 8. The BBCOR CAT 8 Money bat also comes in a drop 5, drop 8 and drop 10. These price out the same as the CAT 8 in the traditional colorway. People really like the heavier drops (5, 8). We think the drop 5 one of the, if not THE, best cold weather bat on the market today. Serious hitters, elite players, love the drop 5 and 8 for its stiff feel and ball crushing skills. The drop 10 has more hand sting then we’d like, but it works. The 2018 Marucci CAT 7 is the same as the 2017 Marucci CAT 7. Marucci doesn't hide this idea. They release their performance bats on a two year cycle. The most comparable bat is likely Marucci’s GS25. That was a limited edition Alex Rodriguez bat also built on the CAT 8 chassis. But, that bat didn’t come in USSSA versions like the CAT OTM has. And, of course, the CAT 8 is very similar in the sense it is the same bat just a different color. But, outside of the Marucci like up, take a closer look at a bat like the Rawlings Velo or Slugger 518 Omaha. We take a look at Alex Rodriguez’s game bat elsewhere. Here, we take a look at the limited edition GS-25 Marucci BBCOR bat. Marucci released what we believe to be the most exciting bat for the 2018. At least in terms of aesthetics, it has taken the game to a different level. The CAT 8 OTM is a single piece bat built with several unique features that make it feel different than traditional single piece bats. Including technology in the knob that helps dampen sting. And, too, variable thickness in the walls to extend the sweet spot, lower swing weight and increase the barrel size.